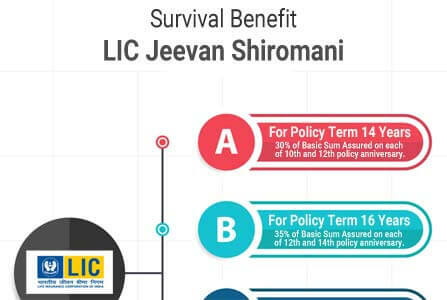 LIC’s Jeevan Shiromani is basically an effective insurance policy that offers complete protection along with savings. Those who are Net-worth individuals, they should definitely invest in this plan. This plan will help your family with great financial support in case of your death during the policy tenure. Apart from this, you will also be liable to get the periodic payments at specified durations during the policy term and a lump sum payment to the surviving policyholder at the time of maturity. This plan also comes with the option of lumpsum amount that will be equal to 10% of the chosen Basic Sum Assured on the diagnosis of any of the specified Critical Illnesses. It offers a life insurance plan with regular payout during intervals of policy term and a lump sum amount on maturity. This plan also offers cover for critical illnesses and has 3 optional riders. Not like other traditional LIC policies, this plan will allow you to get paid-up immediately after the 1st year completion of policy. For all other policies in which LIC deals, the paid feature will be there only if you paid the premium for at least 3 years. This plan also allows you to surrender the same after completing the first year of the plan. This policy allows you to avail the benefits of a loan after a year of the policy. This plan comes along with the inbuilt Critical Illness rider, this plan offers another 3 types of riders and they are Accidental Death and Disability Benefit Rider, Accident benefit rider, New Term Assurance Rider. The plan allows you to opt maximum of 3 riders ONLY. On death during the first five years: Death Benefit defined as the sum of "Sum Assured on Death" and accrued Guaranteed Addition shall be payable. On completing 5 years of the policy years but before the date of maturity: Death Benefit defined as the sum of "Sum Assured on Death" and accrued Guaranteed Addition and Loyalty Addition, if any, will be payable. Where "Sum Assured on Death" is defined as the highest of 10 times of annualized premium; or Sum Assured on Maturity absolute amount assured to be paid on death, i.e. 125% of Basic Sum Assured. 30% of Basic Sum Assured on each of 10 th and 12 th policy anniversary. 35% of Basic Sum Assured on each of 12 th and 14 th policy anniversary. 40% of Basic Sum Assured on each of 14 th and 16 th policy anniversary. 45% of Basic Sum Assured on each of 16 th and 18 th policy anniversary. In case of survival till the end of the policy tenure, provided all due premiums have been paid, "Sum Assured on Maturity" along with accrued Guaranteed Additions and Loyalty Addition, if any, shall be payable. Lumpsum Benefit: Inbuilt Critical Illness Benefit equal to 10% of Basic Sum Assured shall be payable provided the claim is admissible. Option to defer the payment of premium(s): When a claim under inbuilt Critical Illness Benefit is admitted, insured will get the option to defer the payment of premiums that comes under 2 years from the date of admission of Critical Illness claim under the policy. You can pay premium regularly at yearly, half-yearly, quarterly or monthly intervals (monthly premiums through NACH only) or through salary deductions during the Premium Paying Term of the policy. Following are some of the sample tabular annual premium rates (in Rs.) (exclusive of applicable tax) per Rs. 1000/- Basic Sum Assured. If the Policyholder is not satisfied with the “Terms and Conditions” of the policy, the policy may be returned to the Corporation within 15 days from the date of receipt of the policy bond stating the reasons of objections. In case where the insured commits suicide at any time within 12 months 14 from the date of commencement of risk , the company will not entertain any claim except for 80% of the premiums paid, provided the policy is inforce.